Seems like everyone is talking about Acme Bar & Coffee (ABC) at The Troika; a friend of mine dined there three times in the span of a week before going back dinner with me recently. 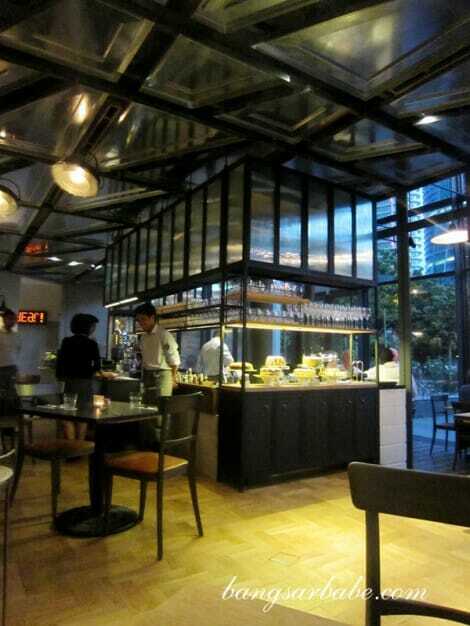 ABC is spacious, with plush sofa seats on the right and a bar with a cake display on the counter. If you want someplace more private, check out the dining area on the 1st floor – cheeky touches here and there. 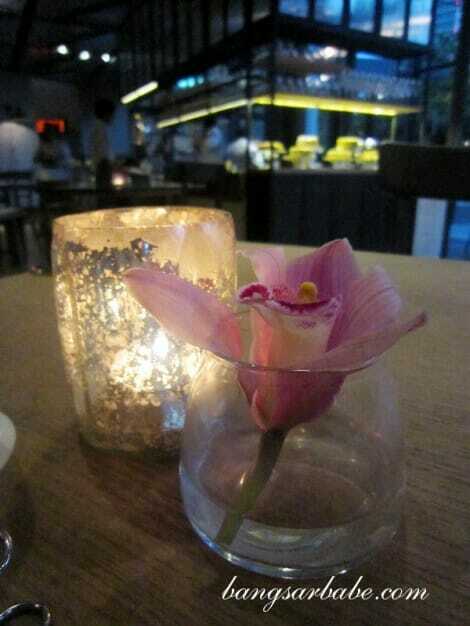 The menu comprises a mix of Asian and Western dishes. Some are safe choices, and others, ambitious, creative and a fusion of cuisines. We started with the Mauzac Nature Dom. Plageoles Gaillac (RM35), a house pour that was bubbly and sweet. It left me wanting more. The Japanese Scrambled Egg Salad (RM25) was unique, but not quite my kind of dish. 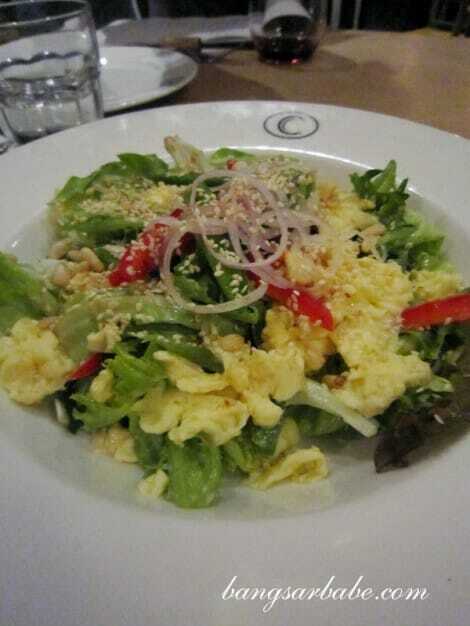 The eggs were firm with a creamy texture, and complemented the light salad. Pardon the picture quality — lighting was too dim for my humble compact camera. If you’re a chilli wuss, I suggest you skip the Salt Fried Green Chillies (RM15). 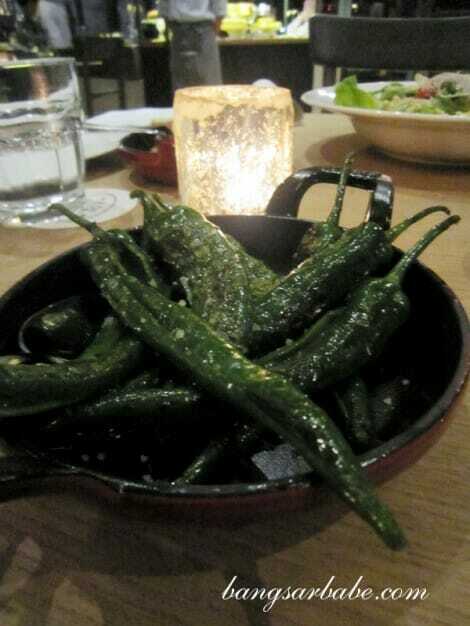 The green chillies were done Padron style and each bite was juicy and to my delight, fiery. 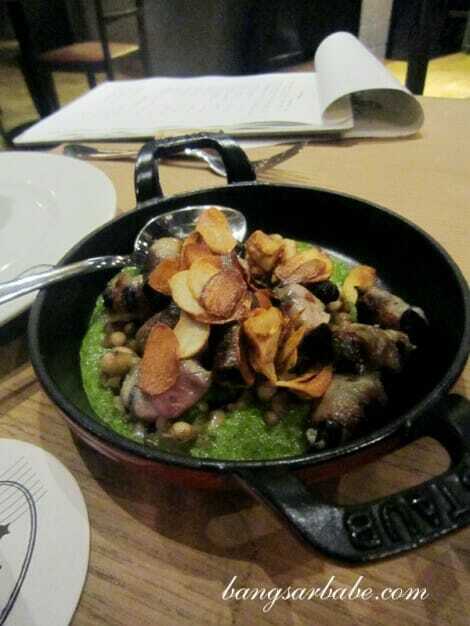 We also had the Grilled “Bacon” Wrapped Snails (RM17) which came with thick garlic parsley sauce and coco beans. Fairly tasty, but hardly spectacular. It was my first time seeing a stem-less wine glass and I liked it better. It’s less formal and easier to hold, don’t you agree? 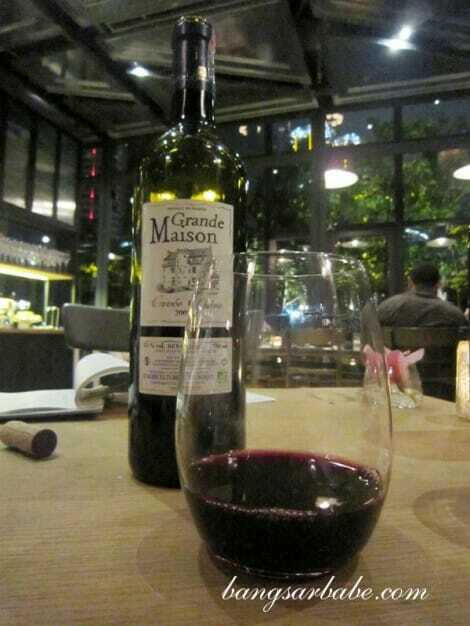 Anyway, I didn’t fancy this wine — Grand Maison Cuvee. It was too dry for my liking but paired ok with both our main courses. 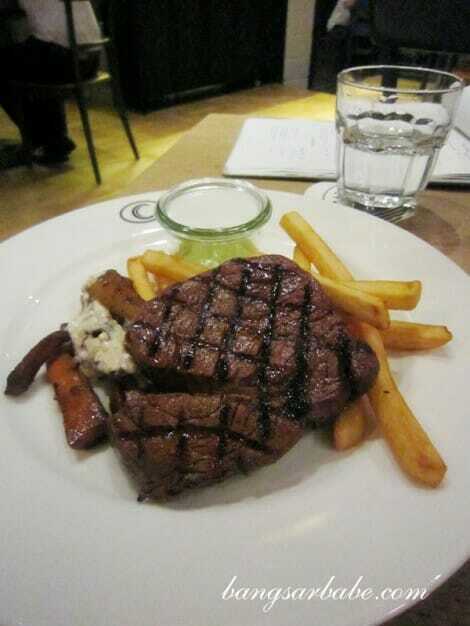 My friend had the Grilled Grass Fed Tenderloin (RM69) which came with hand cut fries, honey roast carrots & rocket mustard sauce. He wanted his tenderloin to be cooked medium rare, but according to our waiter, medium was better. The steak, seasoned with soy sesame, was nicely tender. I found the soy sesame marinade unnecessary but my friend thought otherwise. I am often served the lighter or smaller dish, and in ABC’s case, the less fatty dish. 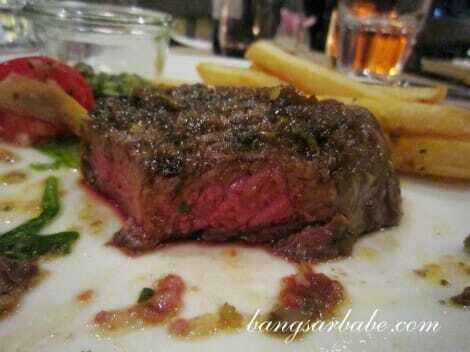 My waiter looked surprised when I told him the Grilled Grass Fed Ribeye Steak (RM57) was mine. I half expected the harissa marinade to overpower the flavour of the meat but that was hardly the case. I enjoyed my ribeye, cooked to medium doneness. The hand cut fries were nothing to shout about but the rocket tomato artichoke was lovely. I liked my meat the way it was and barely touched the salsa verde. 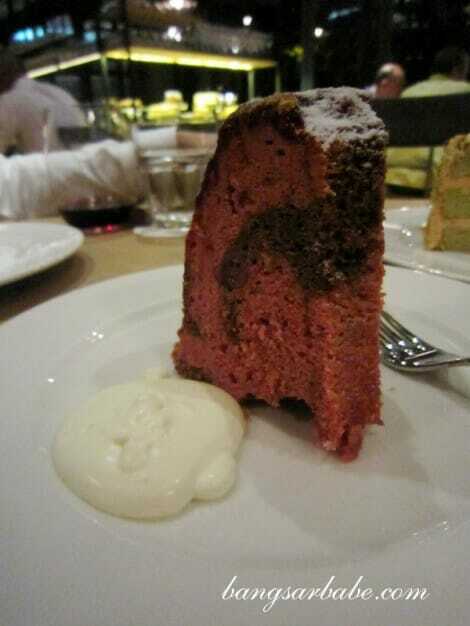 For dessert, we share the cempedak cake and raspberry and chocolate cake (RM15 per slice). 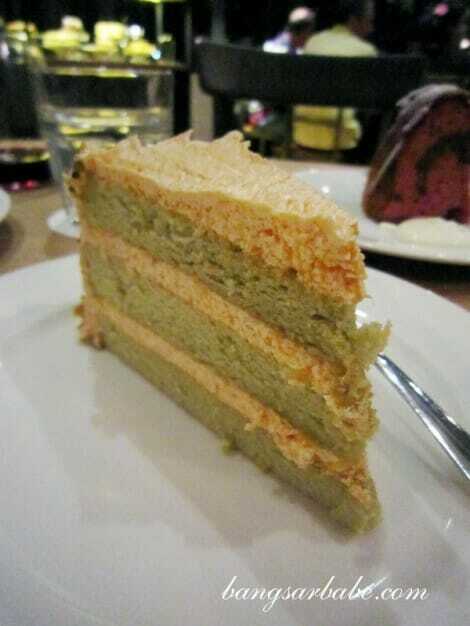 The former comprised light pandan sponge cake with cempedak cream. I must have set my expectations too high again, as I found this just decent. Unique, no doubt, but nothing worth “ooh-ing and aah-ing” about. The raspberry and chocolate cake was a disaster. Dry, crumby and overly sweet, it was as though the cake had been left in the open for hours. Overall, I find Acme Bar & Coffee a bit overrated. While our mains were alright, the starters and cakes were overpriced. I might return for their Sunday brunch, but maybe this time, I’ll set my expectations lower. I agree with Michelle – average is not an option, especially with the prices they are charging. Verdict: Pricey starters and desserts. Good service though. my mom and i agree on your verdict about the cake. and yes, this place is overpriced. the steak looks bloody nice. Yes if you charge premium prices, better be not just good, but excellent. Take Garibaldi for example, damn expensive prices but I was blown away by the food this time. It’s really coming into its element;) I will have to check out ABC soon. d beef is nice n juicy..
too bad i don’t eat beef…. LOL.. 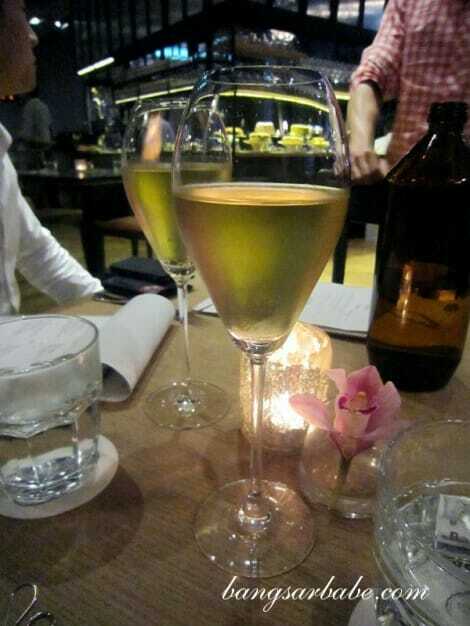 I still prefer the normal wine glass.. i think this is to prevent our hand heat to transfer to wine.. 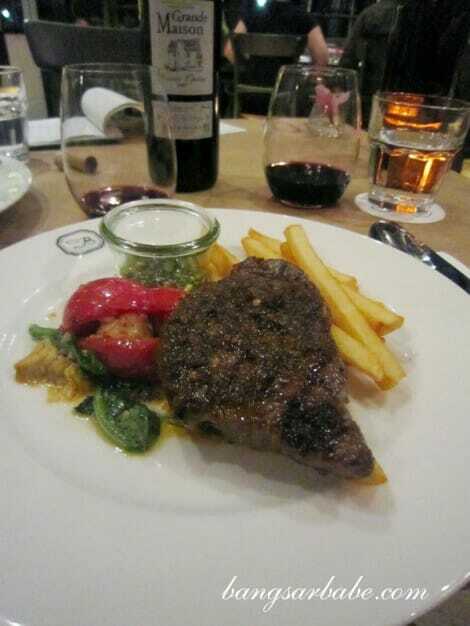 The steak really looks lovely. Am going there tomorrow, hope it’s nice! Very very nice. I like the look of the steak – pink on the inside. Perfect medium. 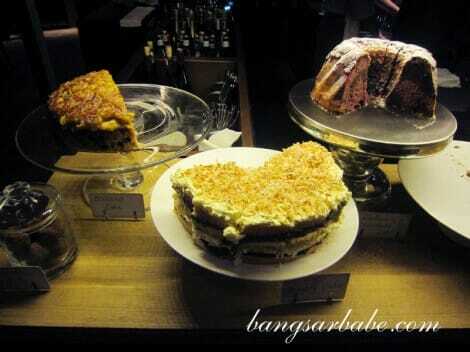 The cempedak cake looks very tempting too! 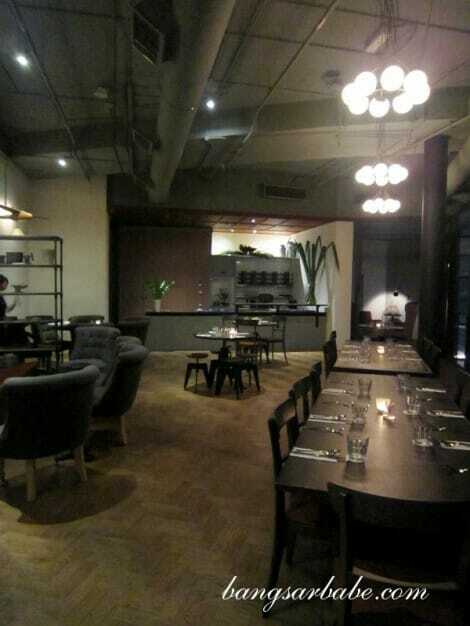 Had dinner at ABC over the weekend, which was great to read your food verdict a t the actual settings! We totally agreed with you, thanks for putting the reviews in the above post. I had the pan fry seabass for mains, very small portion with decent tasting. Keep it up girl, how has the food pictures abuse going on? Proceed to legal advice if possible. Thanks girl! Glad you found the review helpful! I never tried the burgers here, but to be honest, I found the food overrated.